From spending time to understand the process to hand pick quality cotton on the fields, to spending time at the factories, to putting pen to paper to create my own designs, I took care to get all aspects needed right so that my high end luxurious embroidered bedding would not be compromised. Core Values - Chemical Elimination An important consideration for me when selecting yarns and other raw material was to ensure that chemicals were eliminated as much as possible at every stage of the production process. Therefore, all my products needed to be at a minimum, OEKO TEX certified. My collection comprises three different colour palettes consisting of white, ivory and grey. These neutral colours were deliberately selected on the basis of modern designs. Each will suit individual modern day requirements and help in creating the perfect relaxing environment. Each of the white, ivory and grey collection is complimented with classic silver and gold tone threads to give an elegant look and also a backdrop for contemporary furnishings. These tones mixed with other complementing threads offer an elegant choice for any bedroom’s décor. My entire range comes with a minimum 800 Thread Count finished in Sateen. The designs are simple, yet creative and elegant. Stylish and sophisticated looks are best achieved through simplicity. We work with a team of skilled artisans who develop and produce our designs with luxury in mind. The intricacy of the embroidery is created by weaving over seven hundred thousand stitches per design and with great attention to detail. 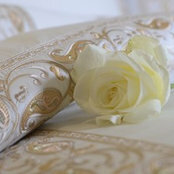 Benefits of Guzel Dezayns Bedding 100% Breathable Cotton - Our cotton is pure, natural and breathable. There are no other fabrics woven into our cotton. It has the ability to transfer moisture away from the skin - on a hot day the cotton will absorb the heat allowing a cool feel - on cooler days, it provides warmth. Thread count 800 - Having a thread count of 800 means that the construction of the fabric is stronger which makes it more durable. In the long run this saves on costs. The quality of cotton used coupled with the 800 thread count provides a feel of total softness and smoothness. Allergy - Cotton is ideal for those prone to allergies and skin irritations. The body does not react adversely to cotton as it might to other non-natural materials. Cotton is a hypoallergenic fabric.